The purpose of the Bennett’s Mill Middle School Band is to impart the appreciation of music to all of its members through successful study and performance. Students are given the opportunity to acquire the skills needed for progression into a high school band program and beyond. It is the goal of the band program to develop lifelong advocates of music. Band has a unique place in the school curriculum. While it is academic in the sense of having a definite curriculum and expected competencies, there are many aspects of band membership that require participation outside of the normal school day. Such activities are considered to be an extension of the classroom. Since band is like a team sport, the success of the band program is contingent upon each band member performing their responsibilities to the group both in the classroom and beyond. The band program has the ability to make a positive statement in our community. 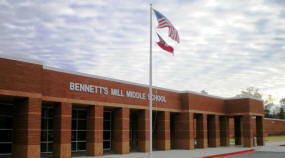 Through our many performances, it is my hope for our band to promote the many wonderful things that are happening at Bennett’s Mill Middle School, in the Fayette County school system, and in the field of music education in Georgia. There are many benefits that students can realize by being a member of the band program. The intense concentration and training required to perform in band is the same kind of training that produces success in any field. Band develops coordination, organization, teamwork, and mental discipline. Bands invariably have a high percentage of the school’s top-ranking academic students. Scholarship and musicianship go hand in hand. Through the cooperation of every student, parent, and teacher, we will have many enjoyable experiences affording musical growth, accomplishment, appreciation and recreation. Students will develop a sense of pride and respect necessary for the continued success of the Bennett’s Mill Middle School Band Program. The BMMS Band has joined the General Mills Box Tops for Education Program, and the whole school is invited to participate. Simply clip the pink General Mills Box Top Labels and turn them into the front office – they’re worth 10 cents each! All the money earned will go toward new instruments and instrument repair.